This remarkable copper alloy jug was found in a manor house in Norfolk, and it is one of three surviving jugs of different size, all possibly made by a London founder. 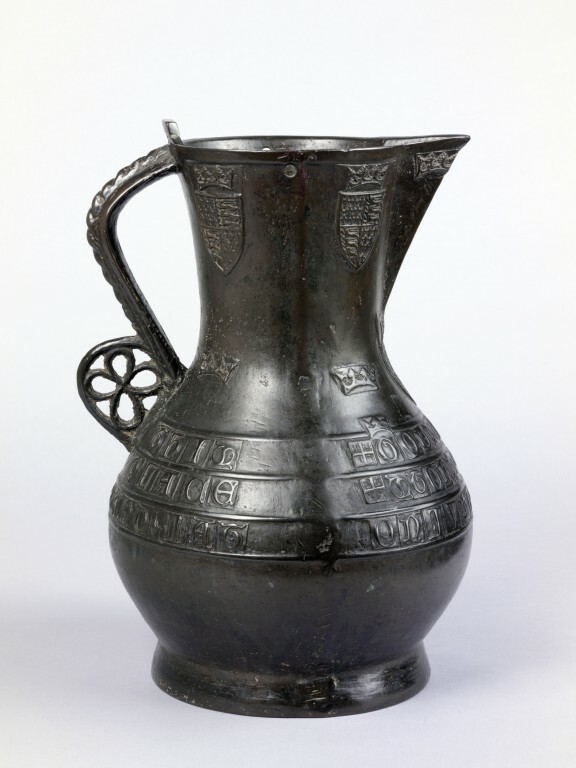 All are decorated with inscriptions and the royal arms of England, as used between 1340-1405.The other jugs are the Asante jug in the British Museum and the Wenlok jug in Luton Museum. The inscription on this translates as "God's grace be in this place, amen. Stand away from the fire and let just one come near." Some of the letters on this jug have been placed upside down and probably indicate illiterate craftsmen. The function of this jug is not known. Its weight makes it difficult to pick up, let alone pour. It is possible that it was intended for use with a ladle, or else was intended purely for dispaly. 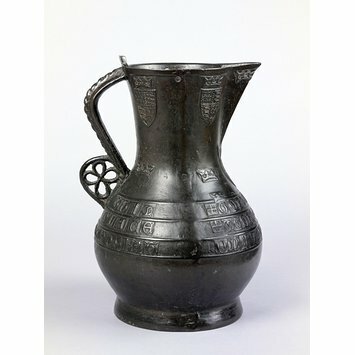 Large bronze jug, with wide belly, spout and rope twist decorated handle with a flower terminal. Decorated with the Royal Arms of England as used between 1340 and 1405, and inscribed in Lombardic lettering in English around the belly of the jug: '+ GODDIS GRACE BE IN THIS PLACE AMEN + STOND UTTIR FROM THE FYRE AND LAT ON IUST COME NERE' (God's gace be in this place, amen. Stand away from the fire and let just one come near). The crowned royal arms are on the front of the jug, and repeated twice on each side of the neck of the jug. There are also crowns on the spout and the sides. In Lombardic lettering, in English, cast into the body around the belly of the jug. Found in a manor house in Norfolk in 1879. Historical significance: Only two comparable jugs survive in public collections, the Asante jug (British Museum) and the Wenlok jug (Luton Museum). The later one appears to have been cast in the same workshop possibly for the use of the royal household. The Robinson Jug, a large copper alloy and lead bronze jug, inscribed in Lombardic lettering in English, '+ GODDIS GRACE BE IN THIS PLACE AMEN. + STOND UTTIR FROM THE FYRE AND LAT ON IUST COME NERE', possibly London, 1380-1400. This jug was found in a manor house in Norfolk. Its inscription translates as "God's grace be in this place, amen. Stand away from the fire and let just one come near". On the front of the jug are the royal arms of England used between 1340 and 1405. The jug has been dated to the late 14th century by comparison with a similar example in the British Museum which has a lid decorated with a lion and a reclining stag, heraldic devices used by Richard II (r. 1377-99) between 1390 and 1399. The jugs appear to have been cast in the same workshop possibly for the use of the royal household. Bell-metal, cast with the royal arms of England quartered with France, and the inscription +goddis grace be in this place amen + stond vittir from the fyre and lat on lvst come nere (i.e. God's grace be in this place. Amen. Stand away from the fire and let who pleases come near).